At Wilmington University we are committed to helping our students achieve their higher education goals. A number of scholarships are awarded annually. Find scholarships online, explore your options and apply. 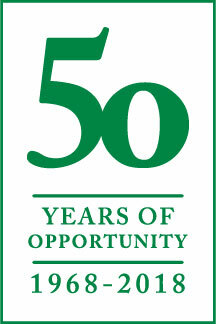 To celebrate 50 years of service and opportunity, WilmU is pleased to offer 50 scholarships to 50 new students! These scholarships target Wilmington University students based on merit, need, or other criteria. Click the button below to see a comprehensive list of scholarships. Wilmington University has partnered with Scholarship America to bring quality degree programs to students. These undergraduate and graduate programs assist in developing a highly qualified workforce. Delaware Goes To College this web site has several scholarships listed for Delaware residents. Application deadlines vary. PEO is an organization that helps women pursue their higher education goals. One of the opportunities it offers women is a continuing education grant known as PCE. PCE is a need-based, one-time-only grant awarded for educational expenses associated with the cost of academic or technical courses including online courses. The maximum grant amount is $3,000, however, a smaller amount may be awarded. For more information, please visit PEO's web site. Use these services to find scholarships online. Recipients of Wilmington University Scholarships are selected without regard to race, gender, religion, national origin, age, or disability unless otherwise stipulated by the donor. The amount of awards is subject to availability of funds. There is no guarantee of award of any scholarship in a given year. Scholarship donors and the Wilmington University reserve the right to modify scholarship criteria at any time. Outside scholarships are not affiliated with Wilmington University. Please exercise caution when pursuing any outside scholarships. Wilmington University does not affiliate with or endorse any third party scholarship website nor does Wilmington University guarantee or confirm the validity of these scholarships and/or websites. Use them at your own risk. Unless otherwise noted, scholarships will be awarded in the form of a tuition/fee waiver. No cash award will be made directly to the recipient(s).